Mac or PC for QuickBooks? I've been doing the bookkeeping (self-taught) for a graphic design business for the past 10 years. The business will no longer be needing my services so I've made the decision to freelance and hopefully build a larger client-base on my own and will be working full-time instead of part-time. I've always worked on a Mac as that's what was available to me. Now that I will be starting from scratch...what is the industry preference? I will be taking courses to gain some credentials but none of the classes I've looked at mention platform. I plan to specialize in QuickBooks as I have been using it on Mac for years. What should I be looking for to give me the flexibility I may need? Hmmm you say you work out of Ontario but Intuit Canada QuickBooks desktop does not have a Mac version. Were you working in QuickBooks Online by chance? It is functional on any PC or Mac. The choice of browser is what is important. In Canada the desktop versions of QuickBooks and Sage are the two software programs most favored by self-employed bookkeepers catering to small businesses. However with cloud accounting opening up over the past few years, there are a lot more options available, each with their own unique solutions. Some of the software is best suited to startup businesses such as WAVE or Kashoo. Others address certain aspects of bookkeeping such as accounts receivable or payables. FreshBooks for example is geared to service businesses not product businesses. I will admit I keep an eye for online accounting software improvements; have tried a few but still favor QuickBooks desktop at this time (August 2014) when doing a professional set of books. as being able to close a set of books to prevent further data entry. I always get nervous when employed bookkeeping clerks want to strike out on their own without any formal bookkeeping training. There are so many things you need to know and keep abreast of especially when transitioning. I commend you for taking courses and hope you follow through on your formal training. 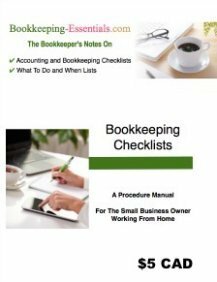 Please consider also joining a bookkeeping association such as IPBC as "book" training does not always transition to "real" world problems such as lack of paperwork, mixing business and personal funds, etc. Self-employed bookkeepers have to be conversant with GAAP, sales tax, payroll tax and the income tax schedule T2125 if they want their work to hold up under a government audit. If you are set on going this route, I recommend staying with what you know ... or in other words specializing in bookkeeping for graphic design businesses for sole proprietors. Corporations have some different bookkeeping and knowledge requirements. You didn't mention the scope of your bookkeeping duties. A freelance bookkeeper's responsibilities are varied. Were you performing month-end and year-end procedures? Who did the bank and credit card reconciliations? Were you producing a monthly financial package for your boss/manager(s)? Were you responsible for payroll? Submitting government compliance reports? Accounts receivable collections? Inventory? Did you handle multi-currency transactions or non-resident purchases? Online purchases? Have you recorded the purchase or sale of assets or loan proceeds? Who was responsible for setting up internal controls and reviewing them to ensure the controls were functioning? Have you thought how you are going to setup your own internal business systems and what your letter of engagement will contain? It is best NOT to figure it out as you go but before you have your first customer. I could go on. Self-employed bookkeeping is not for everyone. You'll find out if you love it or hate it! I wish you well in your endeavors Grainne! Comments for Mac or PC for QuickBooks? Yes - I think education is definitely the first step. I'm also think interning at an accounting firm would be a great step to get "real world" experience. I definitely have not had an opportunity to gain as much experience as I would like - most especially to feel confident enough to go out on my own. Are there specific courses that are recommended? I live near a community college so taking classes on site or online would be an option. I see that the local college has classes in Quickbooks with the "Small Business Bookkeeping" program. Although I'm not sure their courses are enough to qualify for membership in a professional association. The purpose of IPBC is provide support and development to bookkeepers. Not all members are certified. 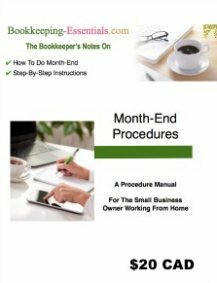 If you think you are ready to be a self-employed bookkeeper, then you are ready to join IPBC ... IMHO. Pure Bookkeeping ... is holding webinars and seminars across Canada this fall. I believe their system teaches you how to setup, run and grow a bookkeeping business. It is my understanding that it requires a bit of investment ... but if you are serous about starting a business, it may be a path to explore. An alternative is Gabrielle's program which I mentioned above and have attended. It is very affordable. AccountingSchool(dot)com has a free webinar called Accounting 101. I'm watching it now. They have colour coded things to help you see visually how accounting statements and transactions inter-relate. It sure would have helped me when I first learning the bookkeeping and accounting concepts. Figuring out the debits and credits was very confusing at the beginning. The course is an introduction to their program. For other course offerings, check out my chat on Bookkeeping Courses. One other thing I should have mentioned earlier. If you reside in Canada and want to use Canadian accounting and tax program desktop software, you require a PC. Mac users can also access the programs by purchasing and installing virtual PC software on their computers. Two products I am aware of are VMware Fusion and Parallels Desktop.